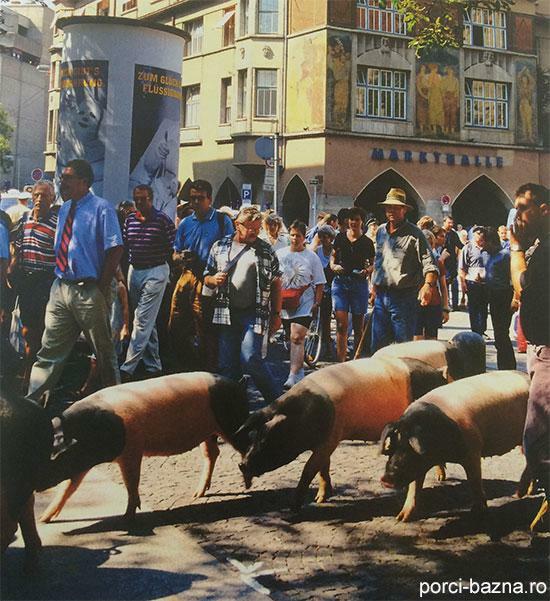 In the beginning of my story, I would like to recall a short historical moment about the promotion of the German pig breed – Schwäbisch Hällische. 19 – 20 years ago, in Germany, there was only a black and white boar and three sows. The Germans realized that if they are alone, nobody will notice them, so they associated with a very rich and influent family, the Büller family, forming an Association. After this, a different problem appeared, the butcheries were refusing these pigs because they had too much fat in their body. The breeders called the media, the radio and the television and got on the streets in the center of Stuttgart and took the pigs by foot until the butchery. They stood in front of the butchery one whole day and made a huge protest. Due to this event, the German learned where can these traditional pigs be bought an all these pigs were sold. From here, the promotion of this traditional breed started and presently this association consists of over farmers, each farmer having hundreds or thousands of such pigs. Of course, after this protest they had to pay the fine, but they were able to promote this breed of pigs. Now, the price of these pigs is three times the price of ordinary pigs, but the taste of their meat is not even close to the extraordinary taste of the Bazna pig’s meat taste. Mr. Büller has been in Romania and took from here, from Transylvania, Bazna sows that he took with him to Germany for the gene pool and for the exceptional taste of the meat. I would like to mention that in 2003 I visited Mr. Büller, with the help of Mr.Fritz Kümerer, they were friends, and I have eaten their products, but honestly they are not even close to the products made from our Bazna pig. I write these notes after three years of not writing anything about the breed. Bazna breed is my pleasure. My desire is not to lose this traditional breed that Romanians had and which they did not know how to keep. They destroyed it, they ruined it, and this is how my pain started seven years ago. It started like a disease that did not let me alone. Almost every day, from afternoon to evening I was going in villages forgotten by the world to find Bazna pigs, my wife thought I was crazy. But after I finished my job (I am a veterinary) I was going away for miles and miles to find the last Bazna pigs, in fairly remote areas, where the meat pigs did not reach to spoil their breed. After I managed to make the Bazna breed known to the world again, they appeared on the markets and fairs. 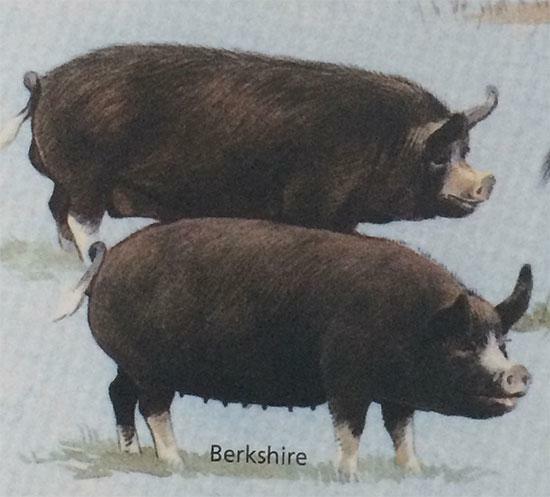 But the ones that appeared on the markets and fairs had nothing to do with the Bazna pig, they were only black pigs with white belt, of Hampshire breed. 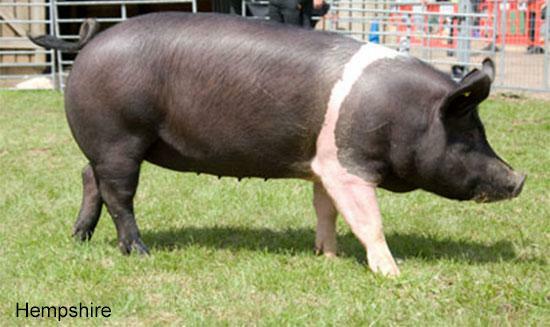 I have read recently that some claim Bazna breed resulted from this Hampshire breed -> this is unbelievable. 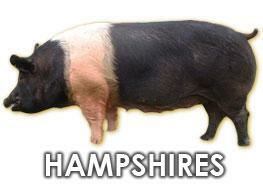 Hampshire is an American meat pig. It is a scam. Unwillingly, they ruin the Bazna breed. 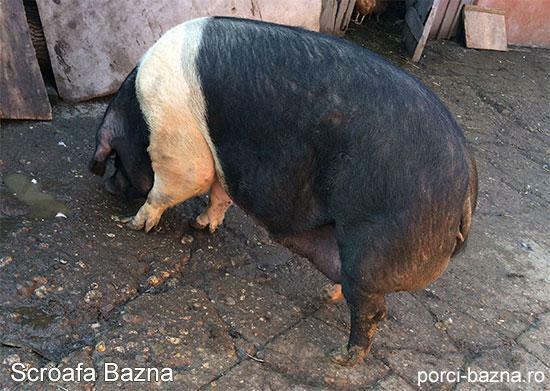 In order to satisfy the demand of the persons who ate the meat of Bazna pigs, a market has been created for this breed, and for those who don’t know it well, all black pigs with white belt are Bazna pigs, sellers and buyers alike. These things convinced me to write and give some examples, some pictures, so that people understand how should the original Bazna pig look like and that „not all that glitters is gold”. Manny consumers look for the black pig with the white belt, but they don’t really know what breed they are buying. It would be a great loss for Romania if we would lose this breed after we made such big efforts to revive it. Most of the pigs from the markets (fairs) Hampshire or co-breeds of these, there are also co-breeds of Bazna with other breeds, which have also the black color with the white belt. I am surprised that many zoo-technical engineers and veterinaries tell me they have Bazna pigs which are more beautiful than mine, and when I go to see them I realize they are not Bazna. What could I tell them? And then they go on that the Bazna is resulted from Hampshire (American meat pig). Indeed, the American meat black pig with white belt looks nice, it has perfect white belt, the muscles are better developed, it is taller and impresses the eye of the buyer. But its meat and fat have no taste. 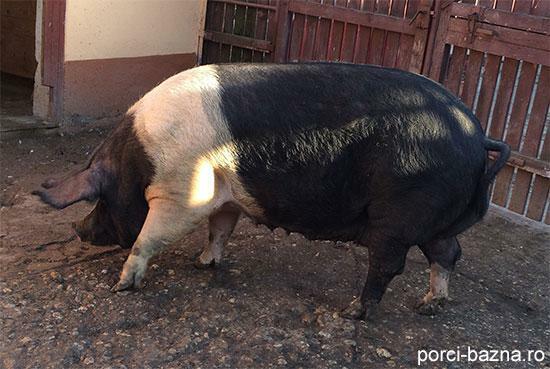 If the meat and bacon does not have a good taste, it is not a Bazna pig, you just bought a black pig with a white belt. 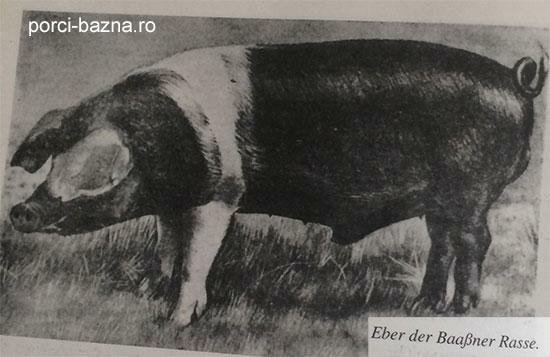 I think 60-70% of the pigs that are sold on the market (fairs) as being Bazna pigs have nothing to do with the Bazna breed, the only thing in common with this breed is the black color and the white belt. If we don’t promote the taste of the meat and the bacon, what is the point of breeding this breed? In order to give an example for everybody, I will post on the site a picture with the gilt, and I wait for her to go into heat, than I will post a picture also with the mate. Some exemplars have the top of their nose, the top of their back legs and the top of their tail white, this feature being inherited from the Berck breed, founding breed of the Bazna breed. The infusions made with the black Berk Crownal breed, with the black and white Edelshwein, Wessex, the white Yorchine breed and Dusoc breed in one of the Agricultural Production Cooperatives was made in an undirected manner. I wonder why none of the restaurants have in their menu: Bazna meat roast or barbeque ? The wise guys that own the butcheries have come to me to buy, but they wanted a lot of meat and a low price, and they wanted to make their products with 10 – 20% Bazna, and the rest industrial pork. So we did not close any deal and we stopped right there. I have fought much to revive this breed, that was practically perished. My heart does not let me give it up to others that think only about profit, to ruin it, it would be a shame and I could not ever forgive myself. If I would have just let things as they were, in probably 5 – 6 years, the Bazna breed would have been completely destroyed. We Romanians make a very good job TO DESTROY EVERYTHING THAT SOMETIME WAS GOOD. Now I am asking myself a question: If in Transylvania, we have been eating bacon during the entire year, people were healthy and hard workers, they were sacrificing Bazna of 250 – 300 kg of which 70 – 80 kg was fat, they were bragging that they obtained 100 kg of grease, and the bacon was melting in their mouth, the bacon on the pig was 10 – 12 cm thick and the meat was less, but in the same time there were no refrigerators to keep the meat. Let’s face it, housewives from Transylvania have always cooked with more fat, but let me come back to my question: this means the people here in Transylvania were more ill than those from other areas of the country? The answer is: NO. Our grandparents were more healthy, they were working on the field from dawn until late in the night, because they did not know about salami, they have lived until they were 75 – 85 years old without even one pill. Since on the market appeared the meat pigs, which allegedly contain lower fat content, people are more sick, as these meat of these pigs contain the fatty acids, which are the bad cholesterol (popular term). This should have caused people to have a lower cholesterol nowadays, as they eat less fat, but the reality is different and you know it. In today’s society the rush for gold is the biggest desire, and to get rich over night. Believe I know, I was the first that tried it and I could not make a lot of money. Those who start their business, will make even less money. What I wanted to do with the Bazna breed, I was able to do. I was able to revive it, to make it known again, maybe a little too known, and now I’m afraid that others will destroy it. The media had an important role in the promotion of the breed, but it also exaggerated and made too much marketing. But, as I have already described you, the media can save the Bazna breed, but it also can destroy it. Many connoisseurs from Romania have contacted me and helped with information about the breed that I did not know, and take advantage of the opportunity to thank them. 90% of the persons who buy from me Bazna pigs, after they taste the meat and the bacon, want to start a business with it, but 50% of them give up when they see that they don’t gain as much as they wanted. The other 10% buy for their family, for the taste, for the health of their family and they come back every year to buy more. 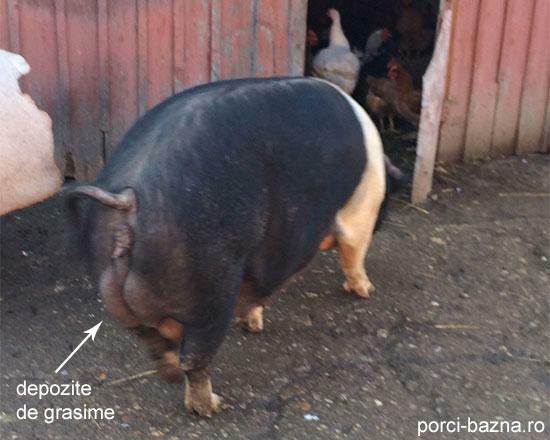 Most of the customers that bought from me after 2-3 years made cross-breeding with other meat pigs, ruining the Bazna breed. And they came back to tell me: look, my Bazna is longer and more muscular, mine grow faster. My questions for them is always -> What about the taste? Bazna is a short pig. 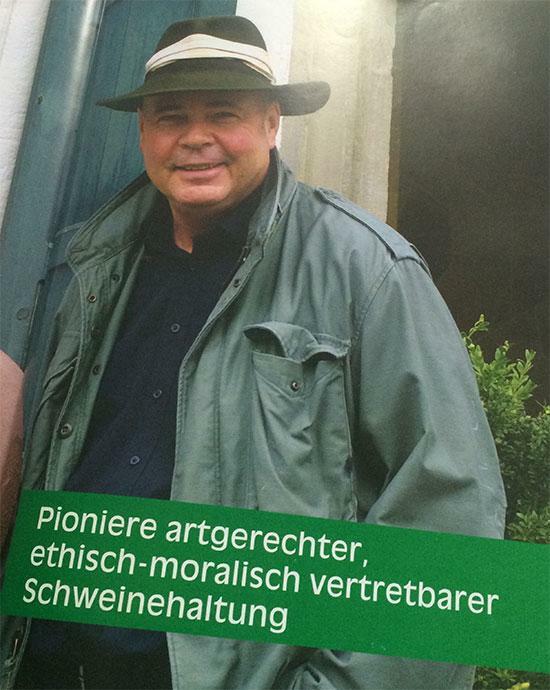 The co-breeding should be done, by specialized persons well trained in the breed issues, and not with meat pigs. We want to strengthen the breed, to preserve their features, to improve them, and not to destroy them. 30 - 40 years ago, when there were no freezers, people were frying the meat and kept it in fat, or they smoked it and they could keep it for 6 – 7 months. Nowadays those who don’t have a freezer (for example the shepherds who don’t have electricity) say that the meat cannot be kept neither in the fat, nor in the freezer. It changes its taste and becomes bitter. And I think they are right, the meat pig has different meat and a different bacon, he does not have unsaturated fat. The meat contains many saturated fats and don’t keep over the winter, but with the Bazna pig it’s a different story. Just give it a try and you will see I am right. Some Bazna exemplars can be fed all their lives only with grass and grains. In the winter they can stay out, in the frost and they lose just a little weight. On the other hand, a meat pig could not survive in these conditions. The Bazna sows give birth to an average of 9 – 10 piglets, at 2 months they don’t look good, they don’t have so many muscles like the meat pigs, the back thighs are small. Some sows sacrifice 1 – 2 piglets if they feel they cannot raise them until the end. For example, if they give birth to 12 piglets, they remain with 10 of them. 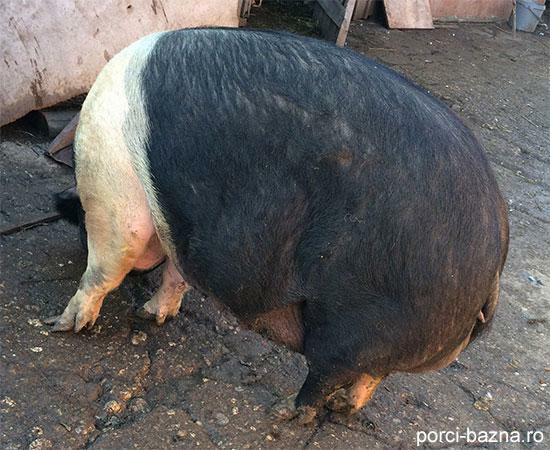 The Bazna sows gain a lot of weight during the gestation and they lose a lot of weight during the lactation. They are very good mothers. Some exemplars are freshened 1,5 months after they weaned their piglets, when they gain some weight and bring their bodies’ reserves to normal levels to gestate again. I have a sow that lactated for her piglets for and a half months and she would have continued, but I took away their piglets. The Bazna pigs have a very well developed herd instinct, even if they are left free, they round around the household and don’t go away, like meat pigs that leave from home many times and they don’t know how to turn back. Some sows go by themselves to the boars, some of them went as far as 15 km away from home (I repeat 15), just that they did not know how turn back home). At the Bazna pig, the 1-2 mm bacon near the skin was harder, with aspect of “tendon”, well attached to the skin, and the rest of 80 – 100 mm is soft and buttery and tasty, the color is white red, specific for this breed. In the past, these pigs were taken out to pasture by a swineherd. There was also a pond where the pigs were bathing, you can imagine the pictures they were leaving on the cars on the road and the fences on their way back home. The last village where I saw pigs at pasture was Leorint. In many regions they were held in chain, I remember my neighbor Andris from Bucerdea Granoasa who came with his sow tied to a chain. One of my sows are from him and this sow is the line founder in my farm, and this is the last Bazna pig tied seen tied to a chain. 25 – 30 years ago, in our area it was a shame to sacrifice a pig that had the bacon under 8 cm thick, of course pigs were bred until they were 2 years old. Nowadays there are around 100 150 sows left in the country, big Bazna pigs, according to the unofficial results. In all the villages from where I have bought a boar or a sow, or were I say black pigs with white belt, the price has doubled from one year to the other. And I have bought the last ones. Anything was black with white belt was Bazna. I have always bought the last boar and after that they called me: “Com’on, Doctor, see what Bazna we have”. Well, I am not a sucker, but also I don’t want people to be suckers, for this I post on my site the pictures. I don’t want people to be fooled by all kinds of co-breeds, or infusions with Hampshire, that have got anything to do with Bazna. First of all, Bazna adapts very well to the pasture, it can eat grass all day like a sheep. I have a sow that is out on the pasture all day long, even eight hours a day. Bazna pig takes from the grass all the vitamins and minerals, for a harmonious growth without any chemical supplements from outside. The passing through the winter consumes their reserves, their energy, because they stay out in the frost and the snow, but in the spring these reserves are rebuilt, by taking from the grass the necessary nutrients. Some fat-soluble vitamins, such as vitamin A, can create reserves in their organisms that last for up to 5 – 6 months. Presently the Bazna breed can be acquired from the farm of Blaj and Turda, thanks to some persons who were stubborn enough to revive it. There still are some more people who breed Bazna, but they should have also 3 – 4 boars to avoid the co-breeding and the problems with the descendants. When I was a student, I have insisted to breed meat boars with the Bazna, I have brought my father meat boars and almost all the sows have co-bred with this boars. It was a big mistake and I take full responsibility for it. After ten years, the people from the village (area) asked to bring them back the pigs they had. They were saying „Doctor, you are the only one who can bring us back our breed.” Finally, I want to tell people that anything they do with passion in this life, will give them success and satisfactions.